WHY? According to FEMA, almost 25% of small businesses do not reopen after a disaster. ✔ Having a quick studio reopen plan will increase the likelihood your business will survive a disaster. Be part of the 75%! What’s the potential in your location for natural disasters (hurricanes, tornadoes, etc. ), toxic spill exposure or transportation blockages? How would these events affect your ability to work? How vulnerable is your building to damage from a windstorm, earthquake, wildfire or other natural hazard? Is it a modern, well-designed building, or an older one that may have been constructed under outdated building codes? What areas could be hazardous? Perform area-specific retrofits on your building: In earthquake-prone areas, make sure all couplings and pipes are flexible, not rigid. If you’re prone to power outages, consider a generator. Visit www.DisasterSafety.org for more peril-specific retrofit project ideas. How often do you perform maintenance on your HVAC, plumbing and electrical systems? Research appropriate fire suppression systems to find effective products or systems that will prevent damage to artwork. Contact the National Fire Protection Association for more information. Do you need specialty equipment to do your daily work? If you lost access to these for a time, would your business suffer? Routinely inspect and maintain critical and specialty equipment and machinery, to make sure all parts are in working order and to catch a potential problem before it occurs. Schedule regular maintenance inspections, particularly for electric equipment, to reduce the chance of fire. Do you count on third-party services or regular delivery of supplies? Research alternate sources of supply, in case your regular vendors and suppliers become unavailable. Could your art business survive if you lost access to your files for a period of time? Do you have files that are irreplaceable and critical to the operation of your business? Back up your computer files or store copies of important documents off-site (at least 50 miles away) where you can access them in the event of a regional disaster. ‘Cloud’ storage is also great alternative for a computer file back up. The effects of a disaster put a tremendous strain on a business’s finances. Are your finances prepared to make it through the recovery period? Set up a line of credit with your bank. Even if you don’t use it during regular business times, it could make the difference when getting back online after a disaster. If possible, build up an emergency fund that could cover essential business expenses for three months. Work out cash flow procedures that are disaster-ready, allowing you to pay vendors and receive customer payments even if your studio and office are not operational. Ready.gov has a printable pdf form to fill in as a planning aid, and tips for every business to be prepared. Wikipedia has a good explanation of what constitutes a business continuity plan: enter “business continuity planning” in the Search field). Open for Business – The Insurance Institute for Business & Home Safety’s streamlined business continuity program is a great resource for small to medium sized businesses. 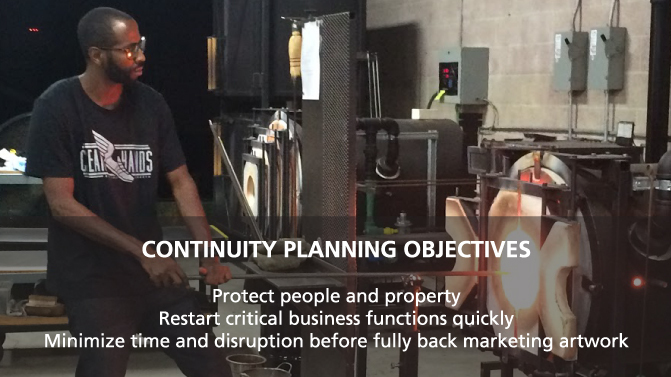 Business owners can download the free OFB-EZ toolkit and create their own business continuity plan using eight easy-to-use modules.